For those who want to gain more knowledge on cardiothoracic surgery, applying for a fellowship is the best course to take as this program enables the resident to get more experience handling various cases such as heart failure intervention, adult cardiac surgery, and thoracic transplantation just to name a few. To apply for cardiothoracic surgery fellowship or a cardiac anesthesiology fellowship, you will need to submit an accomplished application form, your updated curriculum vitae, and three letters of recommendation. You will also need to submit a personal statement to support the rest of your documents. The question many are asking, however, is how to improve their statement to set them apart from the others. The treatment of the heart and lungs diseases with surgical treatment of organs inside the chest is said to be as Cardiothoracic Surgery. The fellowship programs that are popular related to this field are being shared here. These are the renowned program of Cardiothoracic Surgery you must know for sure. Johns Hopkins University is a well-known name that offers medical fellowship residency programs in a wide variety of fields. This is one of those programs. The first in the U.S to offer a residency in thoracic surgery is the University of Michigan. It is the best choice with no doubt. One of the most active and multifaceted fellowship programs in America is the Cardiothoracic Surgery department of the University of Pittsburgh School of Medicine. This program allows participation of four fellows per year. with five accredited ACGME training programs, the KECK School of Medicine has some of the best and largest residency programs in the country. A famous Thoracic Surgery Residency program involves a two-year clinical experience is being offered in the University of Utah. the training of surgeons to work as ethical, competent and independent practitioners of cardiovascular and thoracic surgery is the mission of this residency program. Jot down your ideas. If you have a lot of ideas pertaining to your personal statement, write them down first so you can choose the three best that are relevant to the fellowship program. Explain your reasons. Why did you want to apply for a fellowship? This is the best time for you to talk about why you wanted to be part of the fellowship program. Give supporting statements. The central theme of your residency personal statement should be backed by relevant information. Keep it short. No one wants to read two to three pages worth of personal statement so try to keep yours short but informative and interesting. Keep in mind that your readers have gone through several personal statements already so take it easy on them. Stand out. Think of what makes you unique from the other applicants. It can be a past experience that was close to your heart or a skill that you have that you believe makes you a better candidate. Don’t be afraid of what you can do. Need Help with Your Personal Statement for Cardiothoracic Surgery Fellowship Programs? Worried about your personal statement? You are not the only one who seems to be getting nowhere with their statement. Luckily, help is not that difficult to find because you can get professional assistance from us no matter how fast you need it. One reason why you should hire our service is the fact that we can deliver a high-quality statement for your fellowship application thanks to our professional writers. The writers on board our team our experts when it comes to personal statements for fellowships because of their medical background. Simply put, when you order your personal statement from us, you can focus on your other requirements because you know that you are going to get the best value for your money. 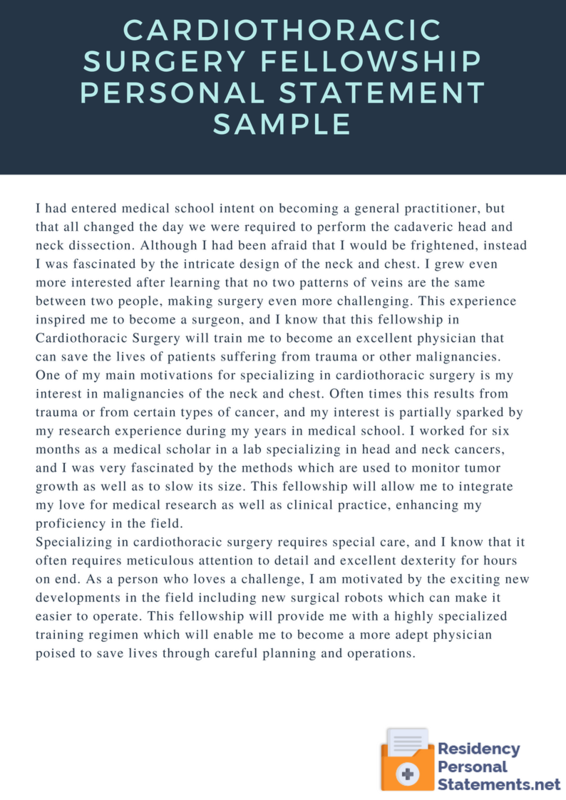 When it comes to writing your personal statement for cardiothoracic surgery fellowship don’t hesitate to come to us. We know how important your statement is for your application that is why we are going to work on yours to the best of our abilities. If you are not happy with our work, you can get your money back because we have a money back guarantee in place. Don’t worry about your statement as our writers will create the best residency personal statements that will impress your readers. 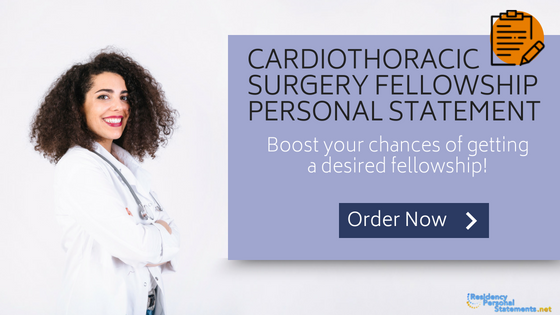 Order your personal statement for cardiothoracic surgery fellowship from us and get the best value for your money!